So today the nutrition consultant came to talk to us about adding calories to her breast milk so she will gain and not lose weight. This is frustrating for me because I thought the whole point of pumping was to prevent all of that. For those who know me well... I should have stuck to my plan from the beginning. Formula would have been a lot easier at this point. Yeah...I was wondering if you would have to fortify too. We had to as well and it was kind of a bummer. We had to go as far as fortifying with formula and also vegetable oil...mainly extra calories that would not bother Hope's crappy kidneys. Good luck with the pumping and fortifying. If you choose to switch to full formula she will be just fine...I know a lot of heart moms that did and would do it again in a heartbeat. Many prayers for continued recovery. OMG what a beautiful smile. Brett you really caught something special. 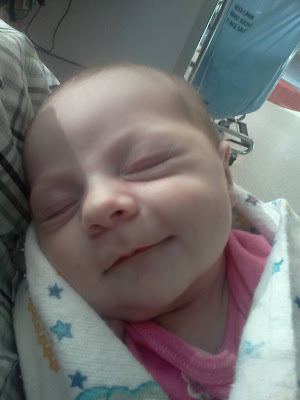 After reading Hope's blog it may not hurt to go to formula if it will help her gain weight. Just add breast milk for some nutrients from that but that way you won't have to pump every 3 hours. You gave her a great start so don't feel bad about having to change to formula. Everyone is still praying for her and they all believe miracles do happen. Love you all, looking forward to meeting my new grandddaughter next Wednesday when I come up with the kids. Give my love to Princess Olivia. I had to do the same for X. Still doing it...I had to stop pumping at 3 months. The stress just killed my supply but I still use extra formula to up the calories. He was 24..after the Glen he is at 22. He had an NG till he was 3 months old. He had a paralyzed vocal cord. He is 14 pounds now. Those extra calories do help. Do what your gut tells you is best ...momma knows! She is super cute! Xavier and I pray for her every day. Happy Thanksgiving. We all have so much to be thankful for! I already shared with you my experience. The fact we were already fortifying with formula (at first to 27 cal, then reduced to 24 because it was too hard on her stomach) really helped transition her to all formula (she was already used to it). After I was hospitalized and realized I would have to stop pumping, we switched the 1/2 and 1/2 bottles to stretch out my milk supply (that was frozen) [ we would do half fortified BM/half formula (increased to the right calories)]. It was so hard for me to make that call, but it ended up being the best choice. She has down awesome. With that said, I know another heart mom who had her BM tested. Turns out her milk contained on average 30 cal. She did not need to fortify her milk. You could always insist yours be tested if you really did not want to add the formula. She is beautiful!!! We, I mean, I, pumped and fortified for 11 months straight. Totally normal, just adding extra calories for our kiddos. Zoe used Carnation Good Start and it was nice and gentle on her belly. Keep smilin' little princess!